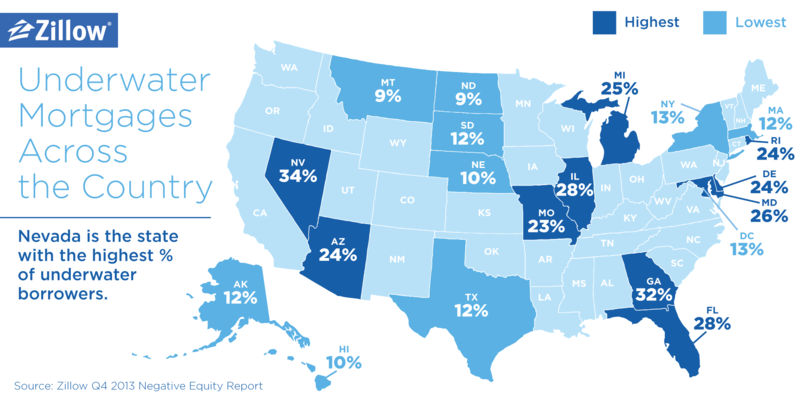 Today, Zillow released the fourth quarter Negative Equity Report. Nationally, the share of homeowners with a mortgage that are underwater, owing more on their home than their home is worth, has dropped below 20 percent for the first time in years. As home values have continued to rise over the past year, millions of underwater homeowners have come up for air and are finally able to put their home on the market. This increase in inventory should, in turn, help create a more balanced home shopping season than we’ve seen in the past few years, with buyers having more choice and perhaps less competition. According to the most recent numbers, nearly 10 million people were underwater on their mortgage in the fourth quarter 2013, collectively owing $657 billion more than their homes are worth. But the number of underwater homeowners is slowly but surely receding. Almost 3.9 million U.S. homeowners were freed in 2013, and the negative equity rate fell to 19.4 percent at the end of the fourth quarter, from 27.5 percent at the same time in 2012. Nationwide, the negative equity rate is expected to fall to 17.2 percent by the end of 2014, signaling further stabilization of the market and likely freeing up even more inventory.